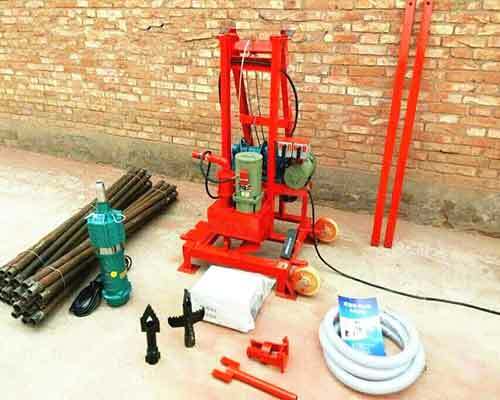 Water well drilling rigs is a series of machine for developing groundwater that people can use the drilling technology to extract groundwater to supplement the water demand of people’s daily life and production.The water well drilling machine can not only be used for domestic water, agriculture water and industrial water drilling, but also is suitable for hydrogeological exploration, construction engineering, bridge foundation drilling. 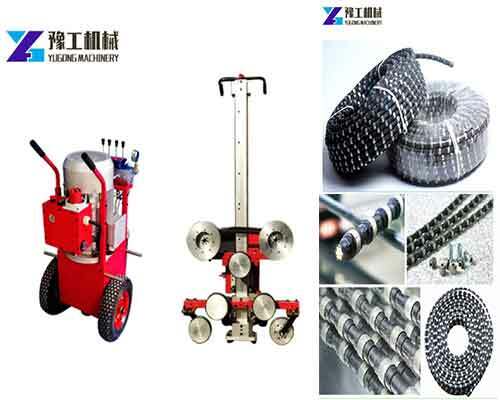 The principles of different drilling equipment are different, which can be divided into the Dayton drilling technology and rotary drilling technology. 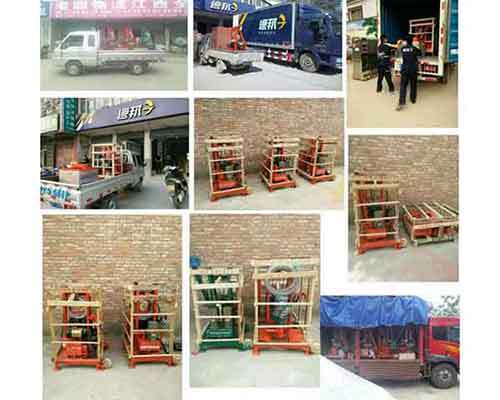 In addition, there are a variety of water well drilling rigs for sale in Yugong Machinery, such as, tractor mounted water well drilling rig, portable water well drilling machine, hand water well drilling equipment, home water well drilling, etc… Pick up the suitable water well drilling equipment according to your requirements and contact us for more details now. 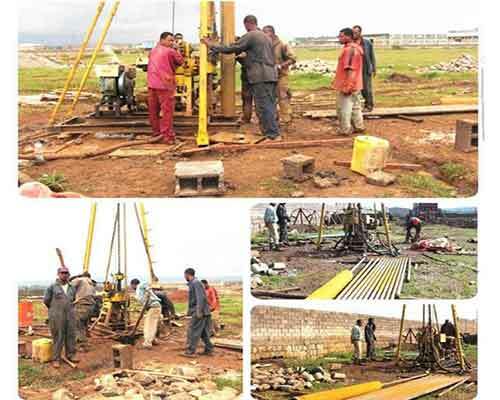 According to the system compositions, we can divide the water well drilling machine into three types: rotary water well drilling rig, impact water well drilling machine and compound water well drilling rig for sale. 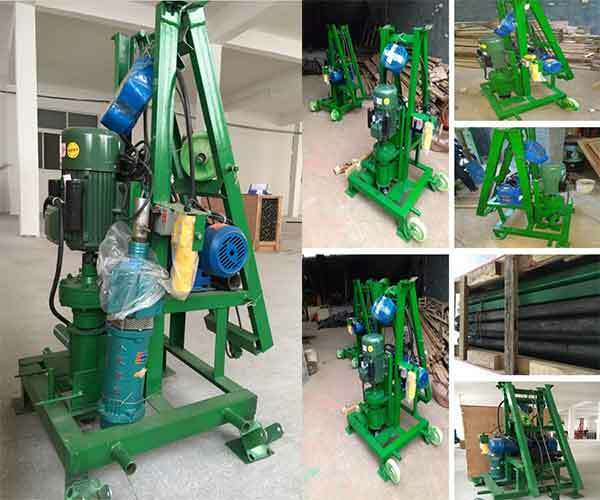 Rotary water well drilling equipment can be subdivided into large and small pot drilling machine, rotary drills with forward and reverse circulation, hydraulic power head well drill rigs, DTH impact rotary drill equipment, etc… So many types of water well drilling rigs for customers to choose. Maybe some people just want to buy this machine,but don’t know which model will be suitable for them. 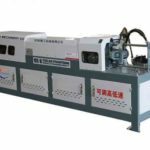 Then I will give a brief introduction of these drilling machines in terms of their size, working mode, working efficiency, suitable operation place, function and some other aspects. I hope it will be of some help to your choice. And if you still can’t choose the suitable types, please kindly advise your main application. 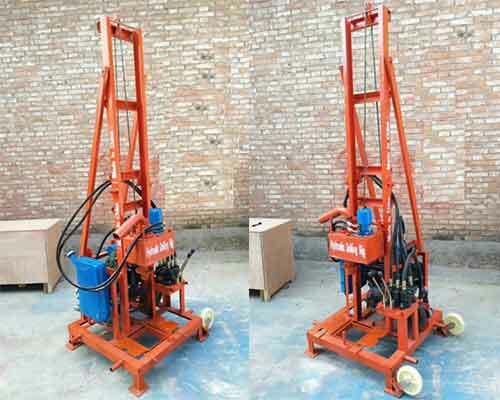 Then we will recommend the best water well drilling rigs for sale in our company to you. 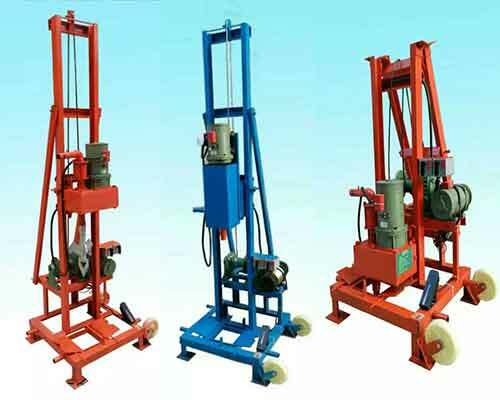 As its name, the small water well drilling rigs or mini water well drilling rigs is a kind of water well drilling rigs for sale with small sizes. It is mainly used for digging soil, limestone and other soft rocks and it’s also recommended to drill hard rock. We just need to equipment different drill bits with the drilling machine for different geological situations. It has the advantages of fast drilling, convenient movement and low price, which can drill the soil 30 to 40 meter in an hour. There are different models of small water well drilling rigs for sale with different drill pipe diameters, length, the motor power, drill hole depth, pump power, maximum opening diameter and so on. You can choose the model you want based on the image and parameters below. Home water well drilling equipment, also be called backyard water well drilling rig is usually small and suitable for home use. 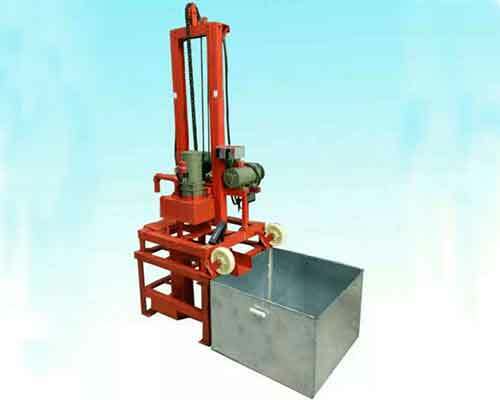 The two phase tank type water well drilling rig produced by our company is such a model. It’s specially designed and economically priced for water drilling in your backyards. 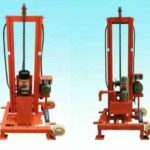 Because they are both of small sizes, it has many similar features to mini water well drilling rigs. It’s very simple to operate, anyone can use it easily refer to the operation video or the operation manual provided by us. 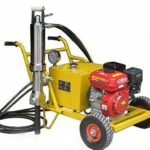 It is affordable and suitable for many types of ground operations, whether you want to buy it for your own backyard or do a business that help other people dig wells, it will be your ideal choice. You can also rent it to others for drilling water wells. No matter how you want to use it, I’m sure it will help you bring great profit. 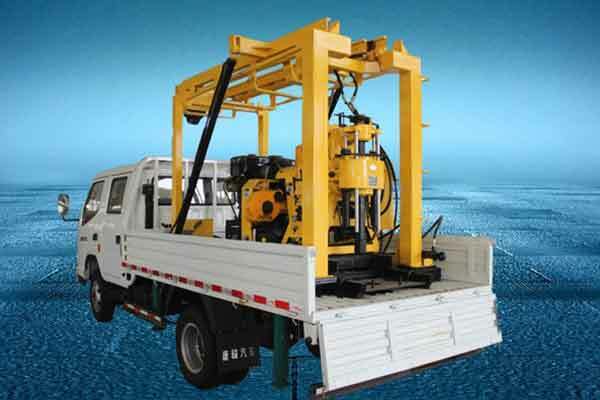 The portable water well drilling rigs for sale in our company is a collapsible drilling equipment. So it’s very convenient to carry and storage. This kind of drill adopts the ball clip clamping mechanism,which can realize the continuous reverse lever and makes it easy to operate. In addition,its drilling function is very powerful with 100 meters of drilling depth and the opening hole diameter can up to 200mm. As long as your drilling needs are within this range, it can meet your requirements. So it’s usually the first choice for those customers who pursue simplicity and convenience. 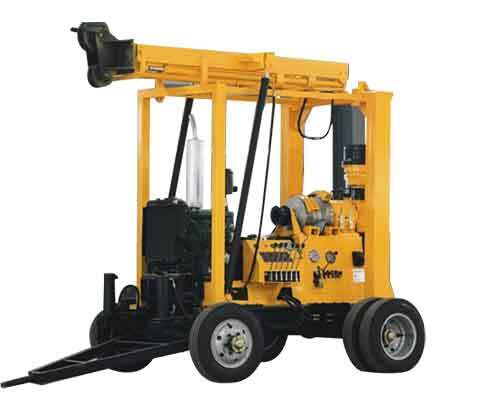 The complete set of equipment of the machine includes the main engine and some necessary tools,such as, a drill pipe with the length of 40 meters, two drill bits, one high pressure water pump, a high pressure water pipe with the height of 5m, a power transformer of 60V, one specification and one certificate. So if the technical parameter of the machine match your needs, please send us email to tell us more about your requirements and we will send you the quotation soon. The tractor mounted water well drilling rig is specially designed to meet the requirements of high efficiency, high speed and strong mobility of field drilling. It is a very popular model for that it’s more productive and can reduce labor strength. 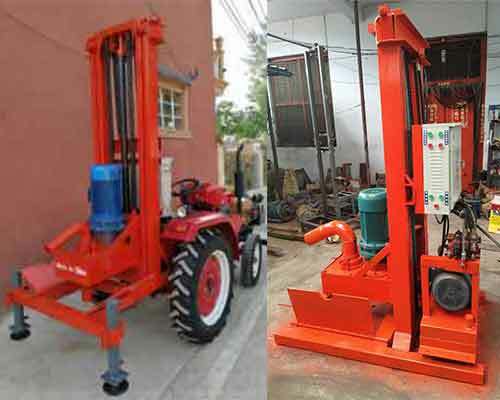 We can supply various tractor mounted water well drilling rigs with varieties of models, sizes and working capacities. 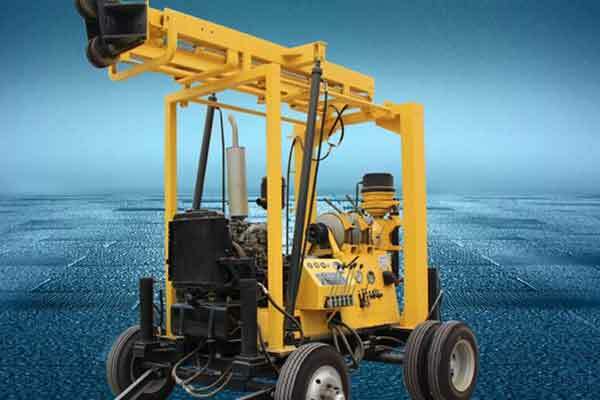 HY-500 is a kind of simple and relatively inexpensive tractor mounted water well drilling machine. Its drilling depth can up to 120m and the hole diameter can reach 500mm. Hang it on the back of the tractor and you can use it very conveniently. 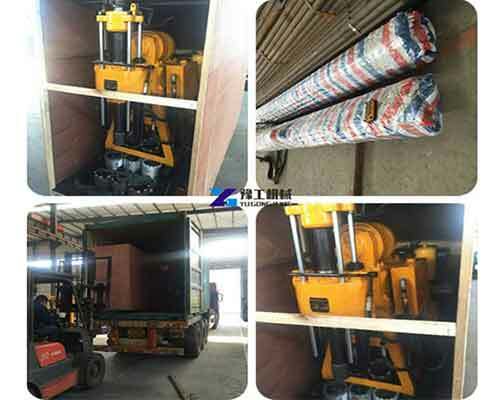 As a self-propelled core drilling rigs, the XYX-3 trailer mounted water well drilling machine in YUGONG is another popular tractor mounted drilling rig. The price of XYX-3 is a little high, but it’s also more efficient and the drilling depth can reach 600m at the same time. Therefore, it is more suitable for large drilling projects. 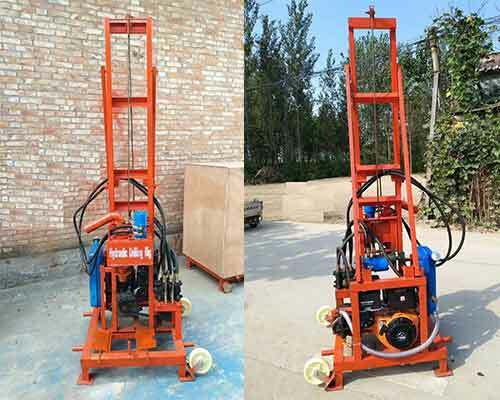 Hydraulic water well drilling rig is a kind of high efficiency and multi-function drilling equipment which is mainly used for drilling wells, agricultural irrigation wells, ground source heat pump wells and some other kinds of wells, especially suitable for water intake projects in mountainous areas and rock formations. It can be perforated on different strata and the maximum drill diameter can up to 300mm. By understanding some of the advantages of this hydraulic water well drilling rig for sale in Yugong Machinery, you will find that it is well worth the purchase. 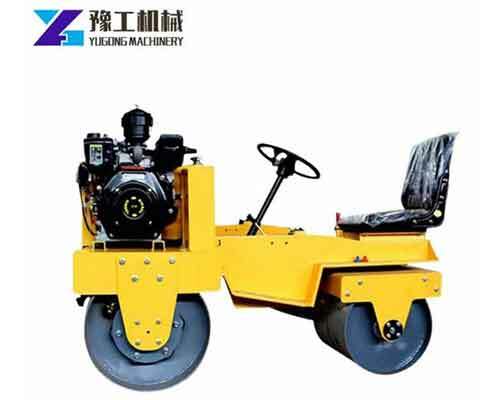 First, this machine adopts new hydraulic technology, which is equipped with large torque hydraulic motor rotation and large diameter hydraulic cylinder for propulsion. The advanced configuration has greatly improved the working efficiency of drilling wells. Second, the design of two-stage air filter and compressed air intake can prolong the service life of the diesel engine. Third, unique pump set design is convenient to maintain which can reduce maintenance cost. 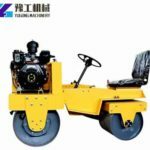 In addition, the two-speed rotation and propulsion can meet the different drilling needs in both soil layer and rock layer. 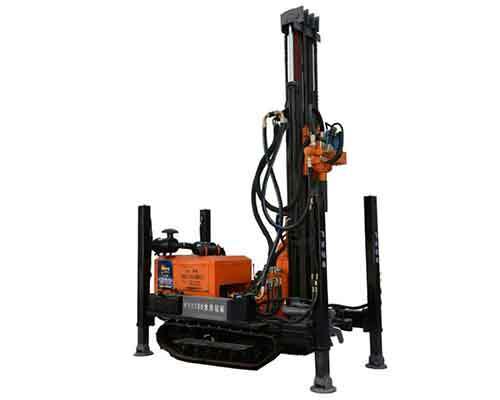 So if you need an efficient and versatile drilling machine, the hydraulic well drilling rig will be your ideal choice. Shallow water well drilling equipment and deep water well drilling mainly refer to the drilling depth of the well. People have different requirements for the depth of well they want to drill. 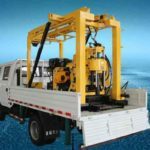 So when you choose a water well drilling rigs for sale, you must first look at its drill hole depth, then compare their other characteristics and advantages. Only in this way can you find the drilling machine that suits you best. There are so many kinds of water well drilling rigs for sale with various drilling depth from a few meters to hundreds of meters in Henan Yugong Machinery. If you clearly know the drilling depth you need, please kindly tell us about this in your email sent to us, and if convenient, also tell us the opening hole diameter and the geological conditions. Then we can give you a more accurate quotation. 1.Hydraulic oil pump. The large displacement pump provides power for the power head, and the small displacement pump provides power for the four-leg oil cylinder, the lifting mast oil cylinder, and the lifting pulley oil cylinder. 2.Four legs. 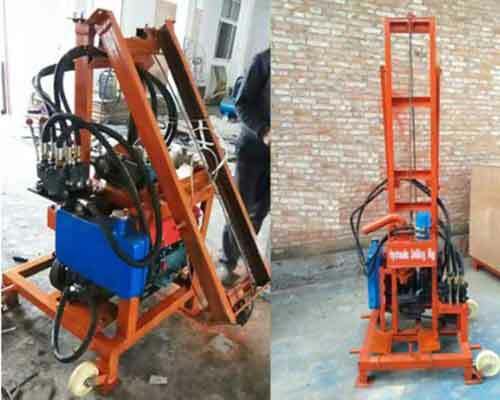 Small water well drilling rigs consists of hydraulic oil cylinder and fixed frame that operators can adjust the level of the equipment at the work site and play the role of supporting and stabilizing the body of the machine. 3.Mast. It is a frame structure welded by a combination of giant steel pipe, channel steel and angle steel. The inner slots of double channel steel are used as the running track under the power head to ensure the perpendicularity of the drill hole. 4.Power head. Use a gear reducer mechanism and there is a large-hole mandrel in the middle of the low-speed shaft. The upper end of the mandrel can be connected with the rubber tube interface of the concrete pouring equipment to conduct concrete pouring. The lower end of the mandrel connects with the drill pipe and drill bits through the flange. And the high-speed shaft is driven by a large torque hydraulic motor. Power system can provide power equipment for the whole machine. Work system can work according to process requirements. Transmission system is used to transfer and allocate energy for the working unit. Control system can control all systems and equipment, as well as coordinate the work according to the process requirements. The auxiliary system to assist the main system. 3.The motor part of the drills should be carefully handled and avoid raining and splashing water when you need to move the machine. 6.Check the circuit and transformer insurance when the motor doesn’t turn. How Does the Water Well Drilling Rigs Work? 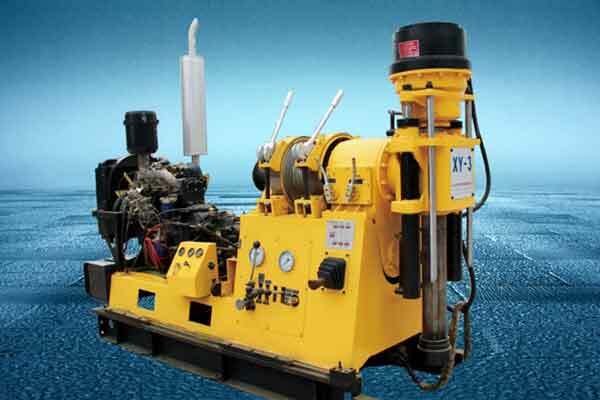 The work mode of water well drilling rigs is pump-suction and reverse circulation. Under the action of atmospheric pressure, circulating liquid flows from the sedimentation tank to the bottom of the well along the circular gap of the well hole through the back ditch. At this point, the rotary disk drives the drill pipe and rotates the drill bit rotation for drilling. Then the negative pressure established by the mud pump suction draws the debris mud into the inner cavity of the drill pipe and rises to the faucet. And then it is discharged into the sedimentation tank through the mud pump. The circulating liquid continues to flow into the hole after precipitation, and so on, forming a reverse-circulation drilling operation. 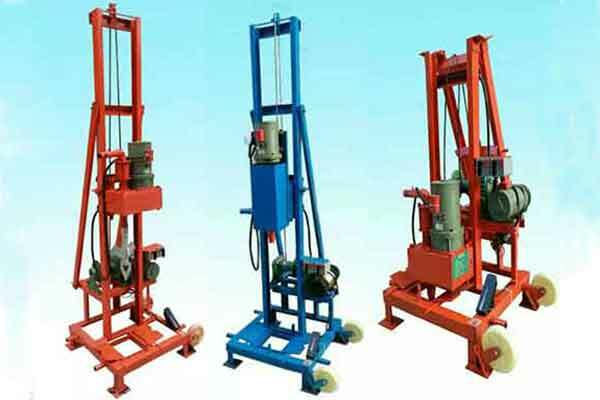 Different types of water well drilling rigs for sale in our company have different price. If you choose the one or more models you want, please click the enquiry button to contact us, then our sales manager will send you the details, catalog and price list according to models you pick up. You may rest assured that we will give you an optimal water well drilling machine price. Since Henan Yugong Machinery Co.,Ltd established, we have obtained a number of municipal, provincial and national certificates of honor. To survive by quality, to develop by reputation is our company’s consistent purpose. Over the past twenty years, we keep learning, innovating and upgrading technology. We have the most advanced technology and production machine now. With so many skillful workers, the production efficiency has been continuously improved. We always insist on providing customers with first-class quality, first-class reputation and first-class service, try our best to meet the needs of customers. Now our machines are not only sold all over China, but also exported to many countries around the world. Meanwhile, because of the good quality and reasonable price of our products, we have received our customers’ general praise. 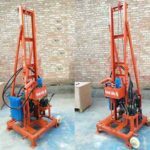 If you are are planning to purchase some water well drilling rigs for sale, as well as some other types of drill rig machine, such as core drill rig for sale, hydraulic core drilling rig, spindle core drilling rig, etc… please feel free to contact us now, we will send you quotation quickly.